The life of one of the smartest men on the planet should make for a cracking story. The film The Theory of Everything has many things going for it which are highly admirable, yet it falls short of greatness. Details (and some spoilers) below. The film is lovely to look at: its cinematography, courtesy of Benoît Delhomme, is sharp and clear. The intended scope of his and director James Marsh's vision is finely shown. The actors are to be commended. Eddie Redmayne's turn as Dr. Hawking has already won him accolades, and may yet win him an Oscar. 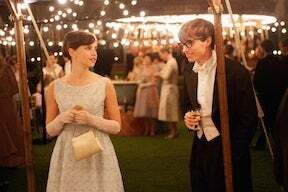 Felicity Jones as Jane Hawking handily stays out of Redmayne's shadow, matching him in charisma and in the strength of her performance. The two have a warm chemistry, and their work together is touching. "Look what we made," says Dr. Hawking, looking with his wife on their children, playing in the palace garden. They are very well-matched indeed. Charlie Cox plays Jonathan Jones, a minister who enters our story in the 2nd act. He quickly becomes close with both Hawkings, and for a time, becomes part of the family. Cox plays him with poise and skill, embodying the English stalwart whose relatively few lines speak entire volumes. Dr. Hawking's theories— his life's work— play little part in the story. The script is not written to elaborate on his ideas at length, likely because the majority of the film's viewers (myself included) could scarcely understand them. This is where the story suffers. The film has no adversary, apart from Hawking's own failing body. His motor neuron disease robs him first of his dexterity, then his ability to stand, then his voice and his very breath. We watch as Hawking's body crumbles, yet after the initial obstacles of his condition, further developments lose their impact. We never see him at work, which is the film's primary weakness. As a man notorious for his work ethic (there are good-natured jibes at his expense, just following the success of his doctoral thesis), we should witness his eureka moments, polishing his ideas, the labor involved in eking out his books, word by painstaking word. Any adversity at all, other than his physical hardships, would be welcome— adding depth and meaning to his triumphs. There are none. His professors chide him briefly over his thesis with one breath, and congratulate him on his success in the next. One person storms out of a seminar, calling Hawking's work preposterous, while the rest of the room soon bursts into applause. As his health deteriorates, Hawking invites his wife to take a lover, if interested. She quietly begins to see Jonathan. Hawking's father disapproves of the arrangement (before it even begins, no less), but there are no negative consequences to his work or his career. The film carries Hawking from success to success, with no time spent on the work that enabled it. His physical condition regularly worsens, but we feel his life to be in jeopardy only once. The film is well-made, it succeeds in the objectives of telling a man's life story. But in skipping over Hawking's actual work to develop and publish his theories, the film fails to wow us with his achievements. It is good. It may even be very good... But it falls short of the greatness one would expect in the tale of Stephen Hawking.